The Monadnock Folklore Society presents the Peterborough, NH First Saturday Contra Dance on August 2nd, featuring Tod Whittemore calling with the Sugar River Band. For the summer months, the Peterborough dances will be held at the Peterborough Community Center near Route 101. Caller Tod Whittemore has been calling dances for forty years, having been lucky enough to begin his career at the time when famous callers Ralph Page and Duke Miller were still active in the Monadnock Region. 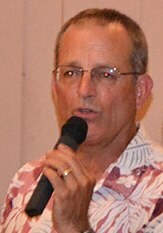 Tod has called dances all over the world, and is known for his humor, energy, and infectious love of dancing. The Sugar River Band plays traditional fiddle music on fiddles, piano, and accordion. The group is led by Jane Orzechowski. Her musical children include: Francis who plays piano, bouzouki, and accordion; and Russell, Neil, Sophie who all play fiddle, piano and accordion. Traditional arts apprenticeship grants have helped to support each of them to learn contra dance piano playing from Bob McQuillen of Peterborough, NH. The dancing begins at 8:00 PM, with an optional introductory workshop beforehand. Admission is $10 or $7 for students and seniors. An open jam session for beginning and intermediate musicians takes place from 6:30 – 7:30 PM. The Monadnock Folklore Society presents the Peterborough, NH First Saturday Contra Dance on July 5th, featuring Lisa Sieverts calling with fiddler George Wilson and Larry Unger on guitar. George Wilson personifies the New England fiddle tradition, with its strains of French Canadian and Cape Breton fiddling — which in turn have strong Irish and Scottish influences — all fused together with Yankee ingenuity to create a genuine New England style. Larry Unger, guitarist, has been a full time musician since 1984, and has presented a diverse range of musical performances at contra dances, waltzes, dance weekends, dance camps, festivals, and concerts all across the United States and in Canada, France, Scotland, Denmark, and Sweden. He’s one of the busiest contra dance musicians around, playing for more than 150 dances every year. 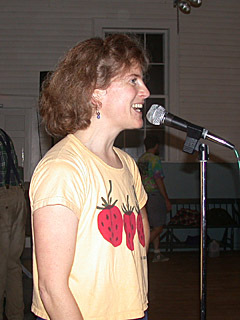 Caller Lisa Sieverts is featured regularly at the Nelson Monday contra dances and she serves on the board of the Monadnock Folklore Society. The dance takes place at the Community Center in Peterborough, NH at 25 Elm Street. For more information call 603.762.0235 or visit www.monadnockfolk.org. The Monadnock Folklore Society has presented contra dances and concerts of traditional music since 1982. The Nelson Monday Night dance will be held at the Peterborough Community Center at 25 Elm Street, just off 101. 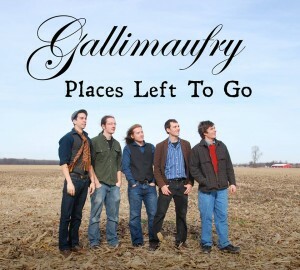 The Monadnock Folklore Society presents the Peterborough, NH First Saturday Contra Dance on June 7th, featuring Michael Hamilton calling with the band Gallimaufry. Caller Michael Hamilton is based in the mid-west. Michael shares the joy of the dance floor by presenting dances with poise and direct simplicity, while maintaining a flexibility and patience to match the abilities of his dancers. Gallimaufry is a high-energy, 5-piece contra dance band that formed in 2010 at Oberlin College in Ohio. With a sound largely based in Irish, Quebecois, and Old Time tunes, arrangements often incorporate elements of rock and funk to create powerful sets that enthrall both the ears and feet of dancers. The dancing begins at 8:00 PM, with an optional introductory workshop beforehand. Admission is $10 or $7 for students and seniors. On March 16th from 2:00 to 5:00 PM, the dance will be held at the Monadnock Center for History and Culture’s Bass Hall in Peterborough, NH, with Robin Hayden teaching dances that will appeal to all, from novice to experienced dancers. Lovely music will be provided by performers Pat Macpherson, piano and TBD. 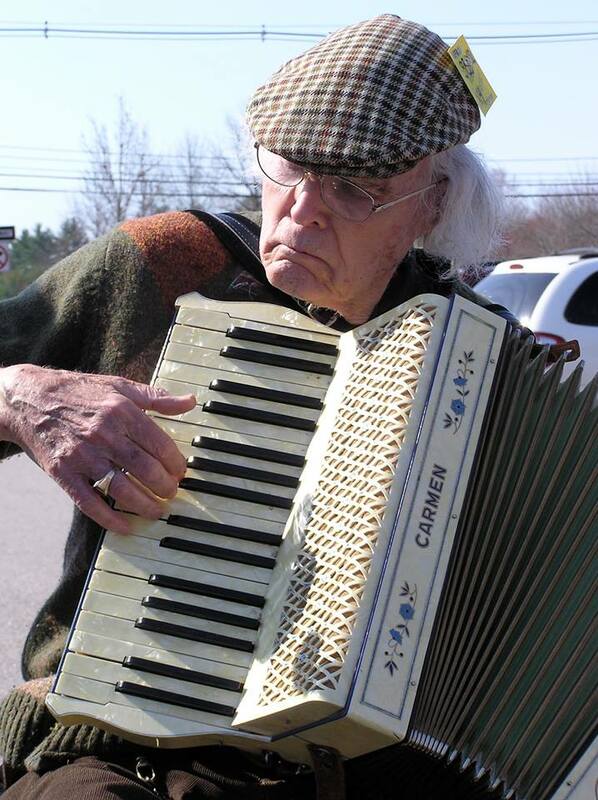 The May 3rd Peterborough Contra Dance will be held in honor of Bob McQuillen. Admission is free, donations welcome to the Monadnock Folklore Society. Callers and musicians are needed, please contact lisa@lisasieverts.com if you would like to participate. Lovely music will be provided by performers Jean Monroe, piano and lydia ievins, violin.